My father-in-law has become an amazing cook, and he made this as part of our Easter lunch this year with the fabulous pork tenderloin recipe (see linked below). This version isn't gloppy with extra sauce like you find in many Chinese take out places. It's very flavorful but also relatively light and healthful. He made a TON of it, but it was the only side dish with no left-overs. Give it a try! Whisk broth, sherry, soy sauce, sesame oil, cornstarch, and chili-garlic sauce together in a bowl. Combine garlic, pepper flakes, and 1 tsp oil in another small bowl. Heat 1 Tbsp oil in a large, heavy skillet over medium-high heat until it begins to smoke. Add broccoli and sprinkle with sugar. 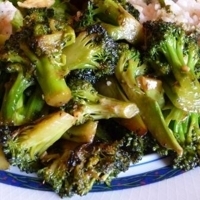 Cook, stirring frequently, for 8-10 minutes until broccoli is well browned. This is the perfect recipe for this dish...not too heavy or saucy but very flavorful. A perfect side dish, but with enough flavor to be a main dish for a light meal. I know five hearts is a lot for a Chinese stand-by, but I loved this! This is a simple but really tasty side dish. Add more red pepper (up to 1/4 tsp) if you want it on the spicy side. This sounds delicious! I cannot wait to try this one soon. Yum, broccoli is a favorite vegetable. I really appreciate this different approach cooking them and will make this recipe asap since I always have some on hand. This recipe well-received by my family and friends. Everyone wanted a copy of it. It's so easy to add or to backoff on the spice if you prefer it more or less spicy. Thanks for taking the time to add this thoughtful review Marianne. Glad your family and friends enjoyed it! This is super tasty! I have a bad habit of making alterations to recipes before I even tried them. But with this one I followed it to the letter and it was perfect. We will definitely be having this again. Glad you enjoyed it Beanz. Thanks again for another thoughtful review. I loved it, I am a big fan of broccoli anyways so I really enjoyed this. I am a new vegetarian 6 months in, and it's a journey. Thank you so much for sharing. I loved it, I am a big fan of broccoli anyways so I really enjoyed this. I am a new vegetarian 6 months in, and it's a journey. Thank you so much for sharing. I like veggies and broccolli is one of my favorites. I like to try other types of recipes that the ones I know. Thanks for sharing this.